We took part in a Percy Hedley Wheelchair Basketball game as part of our Challenge 500 activities. 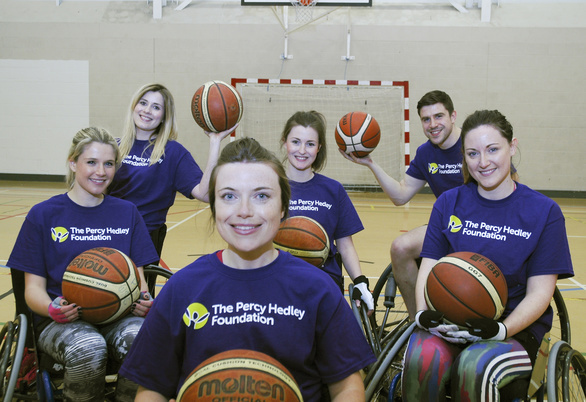 Our team of trainees came up with the idea of taking part in a wheelchair basketball fundraiser, which saw them take on the very successful Percy Hedley Eagles. Hedleys Sport Development Manager Adam Parry began the session with some basic chair handling training followed by techniques on dribbling, picking up the ball and pressing. He went through the rules of the game which are basically the same as for ambulant basketball. Adam has thanked and praised the trainees, Charlotte Littlefair, Tom Justice, Kate Newman, Janine Slesser, Samantha Roberts and Beth Turner, who scored all of Muckle’s points! Sheila Coltman, Corporate Partnerships Manager at Percy Hedley, said: “They all loved taking part and had a lot of fun. It was a great way for Muckle to engage with us, learn a lot about wheelchair sports and raise some funds for us at the same time. For more information, contact Russell Hall on 0191 211 7957 or at [email protected].